Notes: An incredible and stunning album which is showcased at different KupoCon events and features the community’s snapshots from Final Fantasy XV! Various photos in several categories are included from the winners of the Final Fantasy XV Snapshot Contest. New photos are being added over time, and the album is available to view at the events along with the Record Keeper’s Journal. 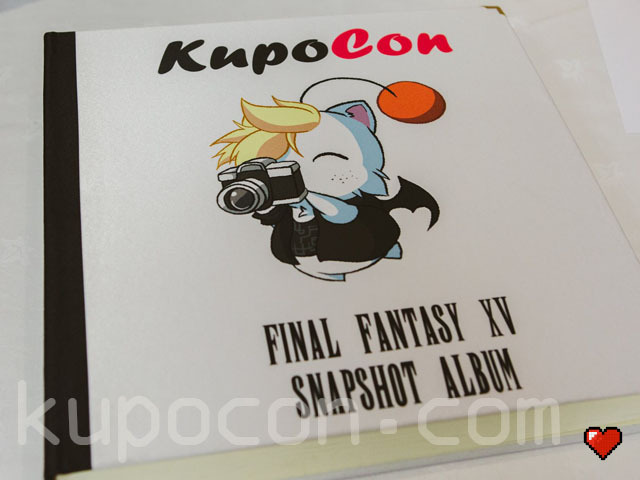 This album is a special one-off item featuring a Prompto moogle on the front (art by Wavechan @ireneylee)! You can view a short video featuring the album here: Facebook Video. More photos and info coming after The Wee Pom!